Ahmadinejad embracing Chavez's mourning mother, must be one of those rare occasions where you would hear me say kudos to Ahmadinejad for doing so. While the cleric accompanying Ahmadinejad. Mir-Tajedini, was trying to pull away Ahmadinejad's arm and remind him that the Islamic Republic's warped and archaic protocol requires Iranian diplomats and officials to avoid any physical contact, including a simple handshake with women; Ahmadinejad ignored Mir-Tajedini and went ahead to fully embrace Chavez's 75 year old mother. Imagine how embarrassing it would have been if Ahmadinejad shunned away from a grief stricken 75 year old mother who needed a moment's comfort from her dead son's best friend. Kudos to Ahmadinejad for showing courage and defying a silly and hypocritical protocol. Lets not however forget the gathering of so many misfits under one roof in Chavez's funeral, as shown in the symbolic picture above. 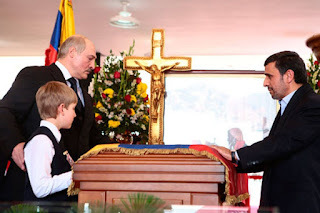 The mad Belarus president, Alexander Lukashenko, with his little mini-Lukashenko, or his "Talisman", as he calls him, always by his side at all events, facing Ahmadienjad across Chavez's coffin. Lukashenko, an unrepented Stalinist, calls himself an "orthodox atheist". Across the coffin is the messianic Mahmoud Ahmadinejad, who sincerely believes he is paving the way for the return of the "Hidden Imam" to establish the most pious world order. Inside the coffin and under the cross of Jesus, lies Hugo Chavez, who Ahmdinejad thinks will accompany the Hidden Imam and Jesus Christ as they return to establish the new world order. Like you, I won't begrudge anyone consoling a grieving mother. But what of Neda's grieving mother or the countless other Mother's who have lost loved ones through the executions, persecutions and incarerations of Iran's black shirted tyranny? Some might think the picture of Ahmadinejad hugging Cheavez's mother moving. Other's standing across from Lusashenko - the butcher tyrant of Belarus - would just view it as a travesty of justice through obscene hypocrisy! Ahmadinejad... Ha, the first Islamic Communist eh!!! -Religious idealogy very quickly sold out to all the corrupt and two-faced gutter principles of political oppotunity!